The brand new AdWords interface is up and running across of AdWords accounts worldwide. It’s glossy, fresh and exciting to work with visually, but the true golden moments of PPC opportunity lie in its new features. Now is the time to get up to speed with Black Friday’s best friend. At this point in time, everyone working in PPC is donning lab coats and playing at being the scientists of their craft, testing the new AdWords features in its shiny beta interface. Google knows some of the trials and tribulations associated with promotions, and we’ve all been there. You’ve written a stunning ad for an engaging new product; your keywords are firing on all cylinders, perfectly matched to your ad copy and landing page. You’ve created a mini masterpiece of highly targeted advertising and are excited to watch the conversions spike. Then you get a phone call. The client is running a fabulous promotion and they want you to make sure the details roll out onto every relevant ad. So you return to your shining ads of wonder and proceed to perform surgery on those immaculate sentences, making room for the offer. Even when the promotion is in place, you’ve left several key USP’s on the cutting room floor that cannot be placed back into the ad until the promotion is over. Our days of pushing out glorious ad copy for ever changing promotions is over. 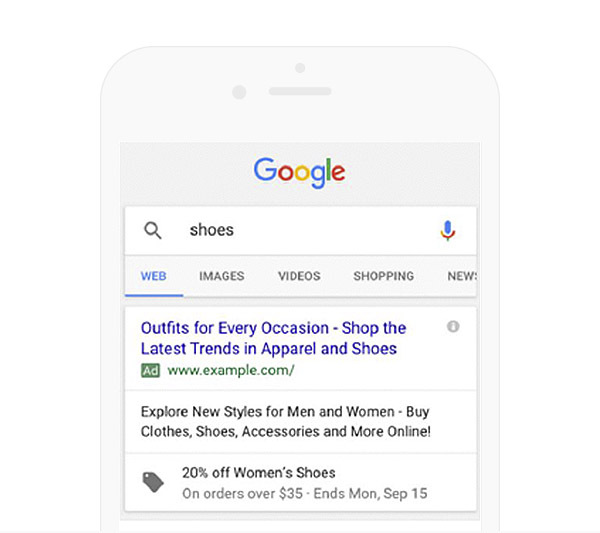 Google has heard our cries and updated the new AdWords interface to include promotion extensions. We will no longer lose data from updating ad copy for a new promotion, maintaining a strong level of detail in our data as traffic levels transition between offer periods. Best of all, these extensions are striking, standing out from all other ad copy with a well sized price tag catching the eye of users as they hunt down the very best offers. As easy to create and edit as any sitelink or callout extension, these are seriously strong new attributes to utilise this Black Friday. 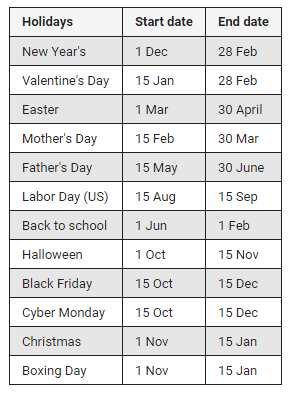 These extensions are available at specific periods of the year, in the time leading up to the paramount moments of engagement for consumers (see table below). Promotion extensions can include an offer period, percentage off and a promotion code. But it’s not just about getting those vital bits of information out to your audience; visually the promotions are a lot bolder. No longer hidden away in existing ad copy, the extensions appear directly below your existing ad, with the title of your promotion appearing in bold, with up to two lines free for details specifically about the promotion. These extensions can be applied at account, campaign or ad group level, with any clicks on these extensions costing the same amount as any regular click on your ad. These will make rolling out promotions a quick and effective task, without sacrificing any precious information in existing ad copy.